Dr Syed Muhammad Husain Shah was born in 1878 in Lakki Marwat in District Bannu, North West Frontier Province of India (now Pakistan), where his father, Khan Bahadur Syed Alim Shah, was posted as Assistant Settlement Officer in the Civil Service of the British Government in India. The family actually hailed from the village Kala Chichi in Tehsil (Sub-district) Shakargarh, District Gurdaspur in Punjab Province. Having passed his early years in Lakki Marwat, he could understand Pushto, the lingua franca of that area. He went to school in Scotch Mission High School, Sialkot where, amongst others, Allama Dr Sir Muhammad Iqbal was his classmate with whom he had a very friendly relationship which lasted for a whole lifetime. After completion of his education at Sialkot he joined Medical College at Lahore and obtained his L.M.S Degree in 1899. Unfortunately, his father passed away the same day on which the result of the Medical Degree Examination was announced. After graduation, he was employed in the Department of Health Services of the Government of Punjab. Some time later after that the Shah sahib was permanently posted at Lahore. In those days, he, along with Khwaja Kamal-ud-Din, Dr Mirza Yaqub Beg and Shaikh Rahmatullah, used to go to Qadian every weekend to spend time in the company of the Promised Messiah. The Shah sahib was a devout and pious Muslim and a sincere devotee of the Promised Messiah. From the day he joined Ahmadiyyat he used to give 1/3rd of his income to the Ahmadiyya causes and spent money generously in the cause of religion and other good causes. As a regard of his sincere devotion and sacrifices in the cause of Islam, the Promised Messiah held him in great esteem, and whenever he visited him, the Promised Messiah would stand up in respect to receive him. When the Sadr Ahmadiyya Anjuman was formed in 1905, the Promised Messiah nominated him as a member of its Central Committee, which was the supreme executive body to manage the affairs of the Movement. He held this position until the split in the Ahmadiyya Movement in 1914. Thereafter, he became one of the five founding members of the Ahmadiyya Anjuman Isha‘at Islam Lahore. Dr Syed Muhammad Husain Shah was a renowned physician of his time. Doctors in the employment of Government were allowed to carry on their private practice after their duty hours and during weekends. During the remaining lifetime of Promised Messiah, both Dr Mirza Yaqub Beg and the Shah sahib used to visit Qadian every weekend at a great monetary sacrifice just to be in the company of Promised Messiah. Even then Allah amply rewarded them and both of them had a lucrative private practice earning them thousands of rupees, a large sum in those days. How renowned a physician the Shah sahib was, is evident from the fact that Dr Sir Muhammad Iqbal, in his letters to Bilgrami (a well-known poet), invited him to come to Lahore so that he could take him to Dr Syed Muhammad Husain Shah for treatment. As a physician, the Shah sahib did not insist upon receiving fees from his patients. Whatever someone chose to pay would be quietly put in his pocket. Many of his patients were poor, and he would see them without any fees and also give them money from his own pocket to purchase medicines and food. He was a saintly person, never hungry for money; instead, he used to spend generously for multifarious humanitarian causes. Dr Muhammad Husain Shah was a very compassionate human being who cared not only about the needs of others but also helped them in the matters of their welfare. When he purchased a big chunk of land on Ferozepur Road, which he later developed and named Muslim Town, he built his house on it and also built homes for his near needy relatives who could not afford to build a house for themselves. He built a house for his dispenser, Shukar Deen, and for his other personal servants. He also built a house for Pandit Qadir Baksh, a Brahmin convert to Islam. He transferred the ownership of these buildings in their names. He not only brought them to live near him but also paid for their education, arranged and bore the expenses for their marriages and even purchased agricultural lands for them in Khanpur District and Bhopal. Amongst others, the parents of Begum Zeenat Fida Husain and Colonel Amjad Husain, father of Syed Mushahid Husain and Syed Mutahir Husain, are examples of such beneficiaries. This was not limited to his near relatives. He helped many other Muslim students, without any distinction of being an Ahmadi or not, in obtaining higher education. The late Hameed Nizami, who after independence became the Publisher-Editor of Pakistan’s well-known daily newspaper Nawa-i-Waqt, was an example of one such beneficiary. Mr. Nizami was treated like a family member and he kept this relationship with the Shah sahib’s offspring until his death. Dr Muhammad Husain Shah was also a big supporter and benefactor of the Anjuman Hamayat-i Islam and was a member of its Board of Directors for a long time. This Anjuman was created for the promotion of education of Muslims of the Punjab Province, and established and ran the Islamia College, Lahore and many other high schools for Muslim boys and girls. In 1918, the Government approached the Central Anjuman (AAIIL) with the offer that it was willing to release some revolutionary Muslim youths who were detained for their enthusiastic anti-Government activities provided the Anjuman agreed to reform them and channel their energies towards the propagation of Islam work. As a result of this move, Muhammad Iqbal Shadai and Syed Mustafa Kamil were handed over to the AAII, Lahore. 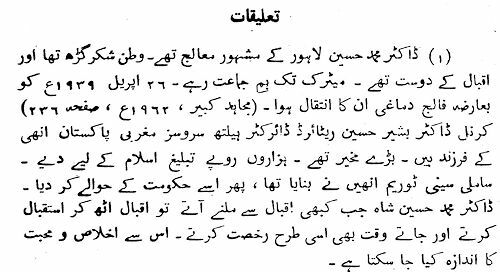 The Shah sahib took Iqbal Shadai into his personal care and he lived in his house in Ahmadiyya Buildings for a couple of years. Thereafter, in 1920, when the Hijrat Movement started, he migrated from India and after obtaining a doctorate degree from a European University became well known in the Muslim world as Dr Iqbal Shadai. Dr Shadai held the Shah sahib in high respect and always remembered him respectfully as one remembers his own father. Murree Hills was the summer capital of the Government of Punjab. In those days, non-government civilians were not allowed to visit Murree. When the Shah sahib first came to Murree in the summer of 1924 he learnt about the poverty of the common man residing in villages and gali jats surrounding Muree. These people were living in a constant state of starvation, and tuberculosis (TB) was rampant in the area. Most of the land, being hilly or with thick forests, was not cultivatable, hence these people had no proper means of income. The population of the area was predominantly Muslim. Tthe Shah sahib not only rendered them free medical treatment but also paid for the cost of medicines in addition to giving them money for nutritious food to help them recover. He was so moved by the miserable economic conditions of those people that he hosted a meeting of land owners of the area along with the officials of the Agriculture Department, the Revenue Department and the Department of Cooperative Societies and urged upon them the need of advancing money to these poor landowners to purchase seedlings and plant fruit trees on the slopes of their land to bring them some income. Many of the fruit gardens of that area are the remnants of the Shah sahib’s efforts in that regard. Furthermore, many of the Shah sahib’s patients were suffering from TB. During the summer months he used to send them to an infirmary in Simla. Many of them would return to him in Murree complaining that the doctors in Simla, the majority of whom were Hindus, did not pay proper attention to the treatment of Muslim patients till payment of gratification. Since many patients in the area surrounding Murree too were also suffering from TB, therefore the Shah sahib felt the need to building a clinic in that area. He talked to government officials as well as landlords of the area but to no avail. Ultimately, he decided to go it alone. In 1928, he purchased 25 acres of land in Samli near Murree to build a clinic. When the transfer documents for the land were yet to be signed, his son, B.H. Syed, who was a final year medical student, advised him to rethink the decision. B.H. Syed (who later became Colonel Dr B.H. Syed and retired as Director of Health Services, Government of West Pakistan) asked his father to consider that since he was about to retire from service in two years and he, B.H. Syed, was still in medical school, where the money will come from to finance such an expensive project. He went on to say that people establish non-profit corporations or trusts for such undertakings and his father was planning to go into this project alone and finally he pleaded that his father rethink rationally as there was still time to walk out of the deal. In reply, Dr Syed Muhammad Husain Shah said, “My son, I too have a ‘trust,’ a very reliable ‘trust.’ When the son enquired as to which and where was that trust, the Shah sahib responded: “Muhammad Husain has a trust with Allah, and whenever I decide to undertake a project for the betterment of mankind I just do it with my best intention, then Allah Himself provides the means because betterment of mankind is Allah’s own job which He takes care of.” So the deed was signed. A clinic was established with the Shah sahib’s own income from his medical practice and after independence it was handed over to the Government of Pakistan by the Shah sahib’s descendents and today it is the largest hospital in Pakistan where more than 350 beds are available for the treatment of TB patients. The Shah sahib was right. Allah is taking care of it. Dr Syed Muhammad Husain Shah was a very hospitable person. During his last visit to Lahore in 1908, the Promised Messiah, along with his family, was staying in the Shah sahib’s house in Ahmadiyya Buildings. A large number of people were coming to visit him and everyone was served food and refreshments. During this period the Shah sahib’s wife kept busy the whole day in getting food prepared for guests and visitors so much so that the Promised Messiah said: “Our stay has caused much inconvenience to our daughter” (referring to the Shah sahib’s wife). After the split in the Ahmadiyya Movement in 1914, when the Ahmadiyya Anjuman Isha‘at Islam Lahore (AAIIL) was formed, Maulana Muhammad Ali was staying in a room in the house of the Shah sahib until a house was built for him adjacent to the Ahmadiyya Buildings Mosque. Maulana Muhammad Ali moved into this house and brought his family there. Maulana Abdul Haque Vidyarthi, along with his family, was living in another room on the ground floor of the Shah sahib’s house. Another room on the ground floor was being used as the Anjuman’s office as there was no office building yet. Another large room on the ground floor was being used as guest house where beds for 25-30 persons were provided and the Shah sahib had detailed a personal servant whose duty it was to look after the needs of guests. The food for guests was supplied and prepared from the Shah sahib’s home. In the beginning there used to be 50-60 persons for Maghrib prayer who all dined together in the Mosque afterwards. This food too was prepared in the Shah sahib’s home, after which Isha prayers were offered and then people would disperse to their homes. Later, food would be prepared in turn in the homes of Maulana Muhammad Ali, Dr Mirza Yaqub Beg and Khwaja Kamal-ud-Din. Even when Dr Muhammad Husain Shah had moved to his new home in Muslim Town, there still used to be 40-50 persons joining him in partaking food at dinner time. Taking dinner in the company of his friends, family members and his other relatives or even those whom he was helping financially or otherwise had become second nature with him. This was a real sense of community based on the teachings of Islam. Dr Syed Muhammad Husain Shah had a deep passion for tabligh (propagation) of Islam. While visiting a patient, if some religious matter was asked by the patient or his family, the Shah sahib used to spend hours disseminating the true teachings of Islam, quite forgetting that he still had to visit and see other patients. During his service he used to preach Islam to his European bosses and he was much respected by them for his high moral character and knowledge in the field of religion. Many of his near relatives became members of the Jama‘at as a result of his propagation work. When the decision was taken in 1910 during Maulana Nur-ud-Din’s time to open a mission in England, Dr Syed Muhammad Husain Shah offered his services for the mission and got approval for an extended period of leave from his job in spite of the fact that his family and close relatives were opposed to the idea. However, on other grounds, Khwaja Kamal-ud-Din was allowed to go to England where he established a mission in London in 1912, which was shortly afterwards, in the summer of 1913, moved to Woking. When Dr Ambedekar, a political leader of the Untouchables (low caste Hindus), announced that due to the inhuman treatment of the untouchables at the hands of Hindus, the untouchables had no option but to embrace other religions where they may be treated more humanly, Christian missionaries gained a lot of converts. the Shah sahib got a month’s leave from his job and, taking Maulana Sadr-ud-Din along, went to Bombay for propagation of Islam amongst the untouchables. Some pagan tribes in the Punjab Province, who were descendents of the original population of India and who had taken refuge in thick forests at the time of the arrival of the Aryans in India, were living in various districts of the Punjab after these forests had been cleared for the making of irrigation canals during British Rule. They were called Sansi and were not allowed to live in settled areas. Many of them lived in Montgomery District (now Sahiwal District). The Shah sahib initiated an Islamic propagation mission in that area and simultaneously he took up the matter with the District and Provincial Administration for recognition of their fundamental human rights, especially their right to live in settled areas rather than moving around as nomads. His efforts bore fruit and a large number of them converted to Islam. Maulvi Shafqat Rasul, who was later a missionary of AAIIL in Fiji, was a son of the headman of this tribe who had embraced Islam. In 1908, at considerable cost, he completed the expansion of Masjid-i Nur. He also purchased a plot of land on which he built a house in Qadian, which he later gave to the Promised Messiah’s family as a gift. In 1910, he purchased land in the Ahmadiyya Buildings compound, Lahore and got the Mosque built on it. Further, he paid the cost of building a gallery attached to the Mosque for the ladies on land which was donated by Khwaja Kamal-ud-Din. In 1914, when Maulana Muhammad Ali migrated from Qadian, he lived for a few months in a room on the first floor of Dr Sahib’s home. This was the same room in which the Promised Messiah had stayed during his last visit to Lahore in May 1908 and in which he breathed his last. The Shah sahib built a house adjacent to the Mosque for the residence of the Head of the Community and Maulana Muhammad Ali moved into it and brought his family to live with him. He resided in that home for twenty years until he moved to his own home, which he built in Muslim Town. Thereafter, the next Head,Maulana Sadr-ud-Din resided in that house until he passed away in 1981. The Shah sahib transferred ownership of the house to AAII Lahore as a gift in 1921. In 1914, the AAII Lahore was founded and the Shah sahib was made its Financial Secretary. There were not many members at that stage and it meant starting from scratch. Expenses for all the projects of the Anjuman at that time were mostly borne through the financial sacrifices of the Shah sahib, Dr Mirza Yaqub Beg and Shaikh Rahmatullah. The Shah sahib obtained a large parcel of land for abadkari (making cultivable) in Khanpur District in Bahawalpur State. When, after clearing the forest, it was made cultivable, the State granted rights of permanent ownership. At that stage the Shah sahib not only got share of ownership for his near relatives but also created a Waqf (Trust) of 25 acres in favour of AAII Lahore, wherefrom the income was received annually by the Central Anjuman. When the Shah sahib purchased quite a large section of land by the Canal Bank on Ferozepur Road, Lahore to be developed into a Muslim town, he reserved 10 acres in it to be called Ahmadiyya Basti, wherein land was offered to the members of the Jama‘at at a nominal price. Only Maulana Muhammad Ali, Maulana Abdul Haque Vidyarthi, Maulvi Murtaza Khan, Master Faqirullah, Deputy Muhammad Sadiq and Ch. Rahmat Khan Bahadur built their homes there, while many others sold out the land at a higher price. The Shah sahib also built amosque in Muslim Town, which was known as Masjid-e-Aisha, in memory of his mother. He also built a well for water supply, wudu etc., and a house for the muezzin, and also created a waqf (trust) of an acre of land in favour of the AAII Lahore wherein the Anjuman later built the Idara Taleem-ul-Quran School for Missionary Training. The Shah sahib donated a house and three acres of land to the AAII Lahore in Samli Sanatorium as a gift which the Central Anjuman, after independence, gave as a gift to the Government for expansion of the sanatorium. In 1938, the Shah sahib transferred the ownership of his two houses in Ahmadiyya Buildings to the AAII Lahore as a gift. On one of these the Anjuman later built the Promised Messiah Memorial Hall while the other was being used by Maulana Ahmad Yar as his residence. The Shah sahib made a waqf (trust) of one and a quarter acres of land in favour of the Anjuman in the Shah Jamal area, Lahore in the name of his wife, Daulat Bibi. This lot was later sold for 48 thousand Rupees and the money was used in the construction of the Promised Messiah Memorial Hall. The Shah sahib donated sizeable amounts towards the construction of the building of the Muslim High School in Ahmadiyya Buildings, the construction of the Berlin Mosque, and for the purchase of 1000 acres of agricultural land in Chak No. 6 near Okara (most of this land was taken away by the Government under Land Reforms in 1966). His wife had donated her 40-tola golden bangles towards the construction of the minarets of the Berlin Mosque. In 1937, the Shah sahib obtained 15000 acres of land in Bhopal State under the Abadkari Scheme. Out of this he got 1000 acres for himself and his near relatives and 500 acres for AAII Lahore. This required clearing of forest trees. Some work was started on it but neither the Anjuman nor the Shah sahib’s descendents pursued it after his death in 1939. This land was taken over by the Government of India in 1961. From the above it is evident that Dr Syed Muhammad Husain Shah was one of the main donors of the Anjuman. Allah gave him much money and he spent it in the way of Allah quite generously, never saving for the future. Out of his large income he used to give a few hundred Rupees to his mother for household expenses. After the passing away of his mother he gave this money to his wife and after her passing away, to his daughter. He never asked them for accounts when they told him that the money was finished; instead he would give them more. The rest of the money he used to give to Pandit Qadir Baksh, who served as his banker. Pandit sahib used to spend money according to the instruction of the Shah sahib and when he ran out he would inform the Shah sahib who would give him more. The Shah sahib had so much trust in Pandit Qadir Baksh that he never asked for accounts from him. The Shah sahib did not keep more than five rupees in his own pocket. The Shah sahib used to take an interest in the political and social movements of Muslims in India. He was a supporter of the Freedom Movement. When the movement for using locally produced goods was launched by Gandhi, the Shah sahib became its quiet advocate by wearing locally manufactured clothes and also having his family do the same. He was actively engaged in the Anjuman-i Hamayat-i Islam and was one of its major donors. His view about the Freedom Movement was that Ahmadis had to be sympathetic to it but should not actively participate in it. Our job was propagation of Islam, and we should let other Muslims actively participate in politics. After 1930, when the Muslim League emerged as an active political party, all of the Shah sahib’s sympathies were with that party. The Shah sahib financed Mr. Hameed Nizami and Colonel Amjad Husain Syed (who were students in those days) for publishing a two-page daily newspaper entitled Hurriyat. In this newspaper, and through Mr. Hameed Nizami and Colonel Amjad Husain Syed, the Shah sahib the disseminated the Muslim League political viewpoint. The next day a very large number of people, both Ahmadis and non-Ahmadis, joined in his funeral prayer, which was led by Maulana Muhammad Ali. Webmaster’s Note: The compiler of the above biography, Masud Akhtar Choudry, lived in Muslim Town for many years in his younger days, and has sometimes recounted his personal memories of Dr Syed Muhammad Husain Shah. This article is taken from the HOPE bulletin of the California branch of the Ahmadiyya Anjuman Isha‘at Islam Lahore, April 2008, with some editing by this webmaster. At this link, see the obituary of Dr Syed Muhammad Husain Shah in The Light, English weekly of the Lahore Ahmadiyya Movement, April 1939. “This high rank of excellence was in fact in fulfilment of the trust that the Promised Messiah had reposed in the late Shah sahib. When the Promised Messiah was informed by Allah of his own approaching death he made an Anjuman as his successor, and while selecting fourteen members for it he picked four from Lahore. These four were: the late Shaikh Rahmatullah, Khwaja Kamal-ud-Din, Dr Mirza Yaqub Baig and the Shah sahib. The excellence and sin­ceri­ty with which these four carried out the task entrusted to them by Hazrat Mirza sahib seems to be indicated in this Divine revelation: ‘In Lahore are our virtuous members’. These four friends had such passion to serve the Divine religion that they would travel from Lahore to attend every meeting of the Anjuman in Qadian and were always in the forefront in providing financial help. … I held the position of Secretary of the Anjuman. The advice of these four revered friends was a source of strength for me, and their sincerity made a deep impression on me. This was how, at the beginning of 1906, there began that friendship between the five of us which developed to the stage that we five became, as it were, one mind and heart. Now four of these friends, one by one, have gone to meet their Lord, and even though I see all around me true, sincere and faithful friends in our Jama‘at but after the departure of these four I feel somewhat alone. But ‘Allah is my Friend in this world and the hereafter’.